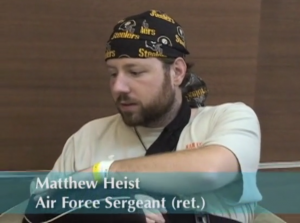 Acus-trained physicians helped Matthew Heist with acupuncture to reduce his medications from 22 to two, and to recover from devastating injuries. See his video testimonial here. The past fifteen years of warfare has generated an enormous number of wounded service members and veterans suffering from chronic pain, post-traumatic stress (PTS), and traumatic brain injury (TBI). Patients with pain and stress problems make up the bulk of clinical visits at military bases and veterans hospitals. Of the approximately 60,000 active duty personnel and veterans with war injuries, 90% live with chronic pain. There are no accurate figures for those diagnosed with PTS and TBI, however, an estimated 400-500,000 suffer from combat-related stress conditions and impaired cognition. These debilitating conditions commonly do not respond adequately to pharmaceutical and other neurologic and psychiatric interventions. Research has shown acupuncture to be a highly successful treatment for acute and chronic pain, headache, sleep disorders, as well as stress and anxiety symptoms, including PTS. Acupuncture, as primary treatment or complement to conventional therapy, has been enthusiastically embraced by military patients, veterans, and physicians, although it has not yet been fully integrated into military medical care.